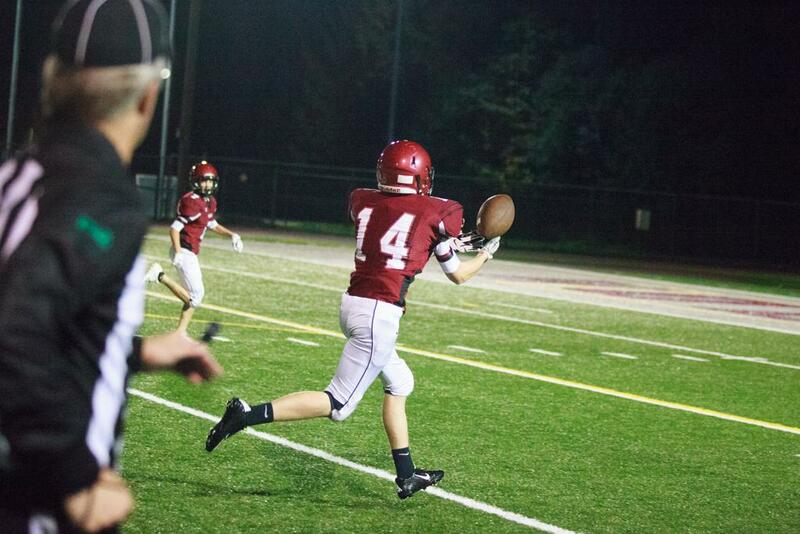 The Eastlake freshmen managed a 27-12 victory against their counterparts from Woodinville on Wednesday night in a game that was closer than the final score indicated. 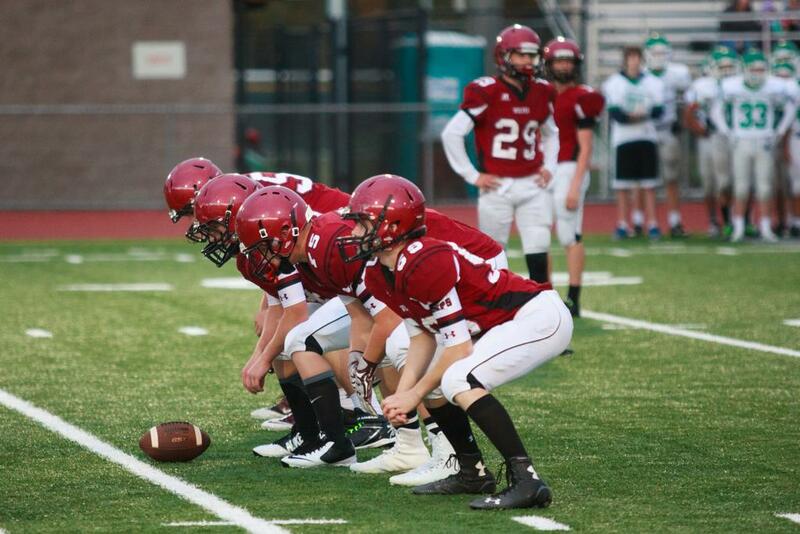 The Eastlake freshmen managed a 27-12 victory against their counterparts from Woodinville on Wednesday night in a game that was closer than the final score indicated. Eastlake came into the game with a couple of key players out with injuries, and had a couple more banged up along the way, but a sturdy defensive effort and some timely execution on offense allowed the Wolves to notch another in the win column. The game started slowly, with Eastlake managing just a single first down before turning the ball over on downs at midfield on its opening possession, followed by a similar short drive by Woodinville which also resulted in a turnover on downs after one first down. Eastlake got to work quickly on its second possession with quarterback Vini Monteiro finding Cade Prinzivalli on a quick wide receiver screen for a nice gain. After a couple short runs and an incompletion, Monteiro hit Nate Sutter with a nice pass over the middle to convert a 4th down in Woodinville territory. A few plays later it looked like Monteiro would hook up with Prinzivalli again on a go route, but the ball just eluded the receiver’s grasp. A flag against the Falcons for pass interference on the play resulted in an Eastlake first down at the Woodinville 15 yard line. On the next play, running back Andrew Plummer popped through the line and galloped right up the middle for a touchdown. In all, the drive covered 65 yards on ten plays with four first downs. The PAT failed when the kick sailed wide right, leaving the score at 6-0. 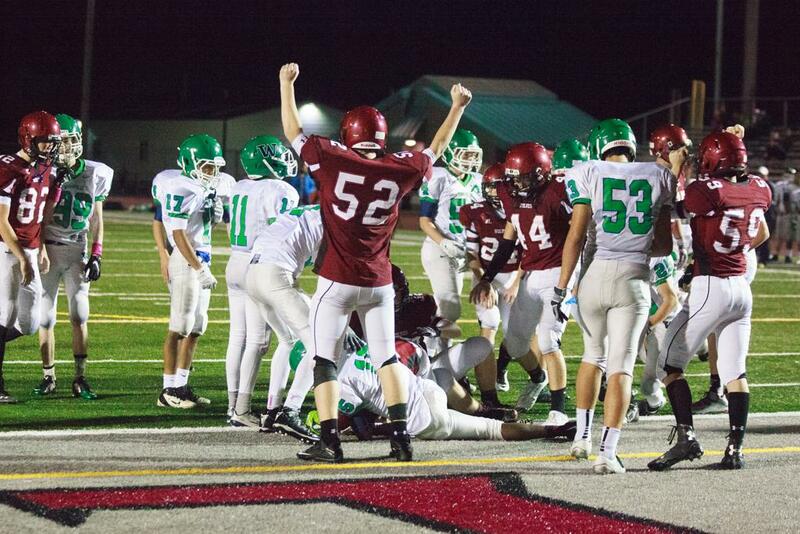 In what has become a recurring theme this season, the Wolves’ special teams unit came up big on the ensuing kick-off. Kicker Taige Thornton executed an excellent directional kick-off, chipping the ball over the first two rows of Falcons. The ball skidded softly down the Eastlake sideline short of Woodinville player who was positioned deep to return the kick. A moment of confusion and hesitation on the part of Falcon player allowed Eastlake to recover the kick and take possession at the Woodinville 29 yard line. Eastlake was unable to capitalize on the excellent field position and ended up turning the ball over on downs without gaining any ground. Woodinville’s subsequent drive was a quick three-and-out, with Eastlake linebacker Brody Leslie notching a nice tackle-for-loss on a run play during the Falcon possession. Eastlake took over at its own 34 yard line following the Falcons’ punt, but was again stymied and punted the ball back to Woodinville after its own 3-and-out. Woodinville’s third possession of the game started near mid-field but whatever opportunity that field position presented was quickly neutralized by the Eastlake defense. A first down pass by Woodinville down the middle was deflected and nearly intercepted by Leslie, who covered a lot of ground from his middle linebacker position to even have an opportunity to come up with the football. A wide receiver screen by Woodinville resulted in a loss following an emphatic tackle by cornerback Nate Sutter who read and reacted to the play immediately. 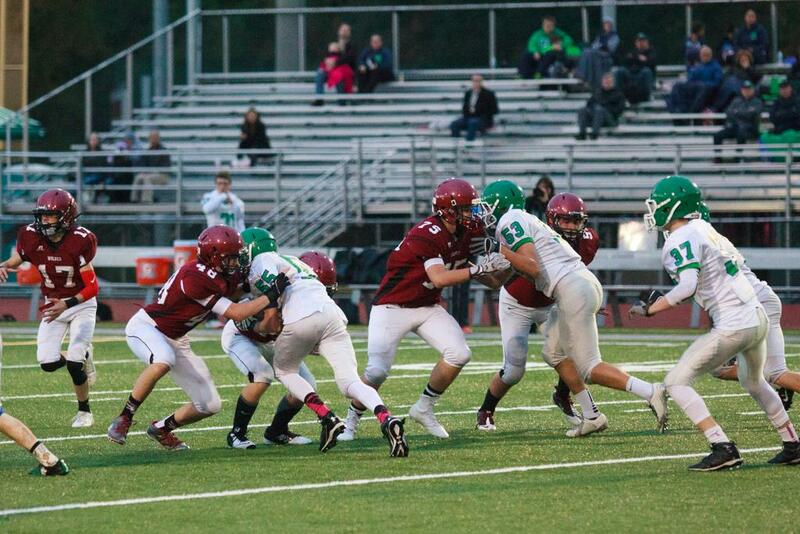 Mihir Vadlamani and Will Woodgate combined for a sack of the Woodinville QB on third down. The Falcons set up for a punt on 4th down but attempted to pass the ball for a first down instead, a bit of subterfuge that didn’t fool Thornton, who very nearly picked off the pass. Instead, the ball fell harmlessly to the ground, restoring possession to the Wolves on downs. Eastlake’s offense took the field with great field position, at the Woodinville 38 yard line, and managed a first down, but a Woodinville defensive back intercepted a pass along the Eastlake sideline and sprinted untouched for an apparent “pick 6”. But wide receiver Jack Rud never gave up on the play and managed to run down the Falcon defensive back and trip him up just inside the Eastlake five yard line. Unfortunately Rud’s great effort play was for naught, as Woodinville scored on a 4 yard run on its first play after the interception. Oddly, Woodinville’s coaching staff chose to try a fake extra point and the two point conversion pass was broken up in the end zone, leaving the score at 6-6. Both offenses would have the ball one more time in the half, but neither could get anything going. The second half started like the first half ended, with each offense sputtering and unable to mount anything resembling a drive. Woodinville’s second possession of the half started in Eastlake territory and the Falcons were threatening following a first down, but Sutter alertly intercepted an errant throw by the Woodinville QB giving the ball back to the Wolves’ offense at the Eastlake 30 yard line. Eastlake mounted a promising drive, with Monteiro finding Sutter on a bubble screen for a nice gain and later hooking up with Prinzivalli again on a really nice throw and catch over the middle on 4th down. 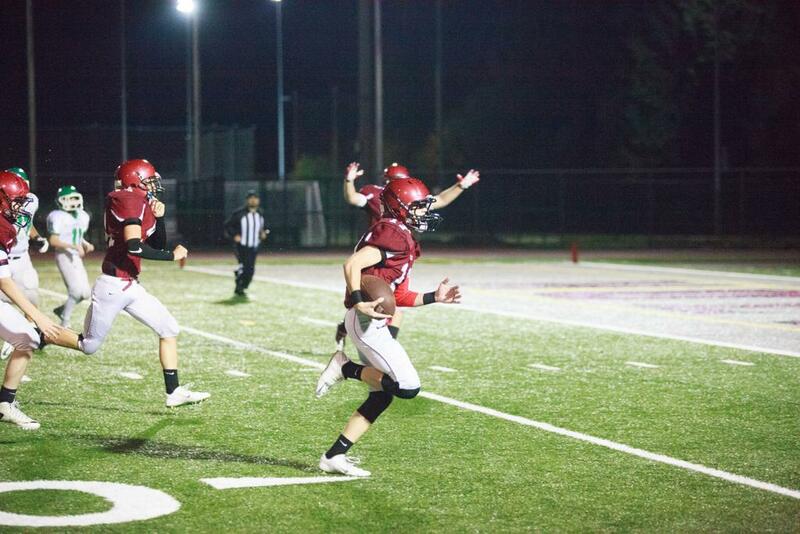 But the drive was ended at the Woodinville 20 yard line with an interception. Woodinville was again unable to get anything going on offense and Eastlake took over at the Falcon 45 yard line following a punt and return. It looked like another possession would end fruitlessly, but Monteiro again hit Prinzivalli on a 4th down pass. A play or two later Austin Gray broke a long run up the middle for about 20 yards, ultimately being dragged down inside the Woodinville five yard line. 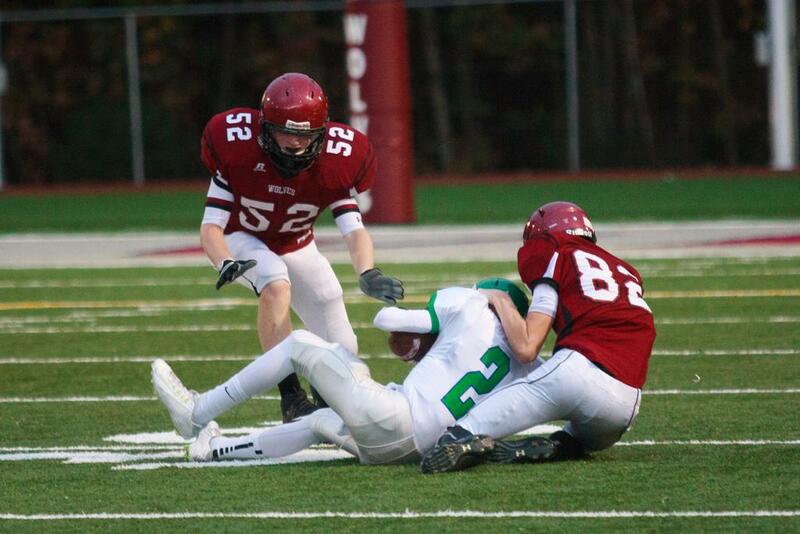 Sutter sliced up the middle for a rushing touchdown out the Wolves’ short-yardage formation on the very next play. Thornton converted the PAT, staking Eastlake to a 13-6 lead. Thornton absolutely mashed the ensuing kick-off and it was mishandled by the Woodinville kick returner, resulting in the Falcons starting their next possession at their own 17 yard line. A couple of offensive holding calls pushed the Falcons backward and the Eastlake defense took care of the rest, leading to a Woodinville punt from its own end-zone. 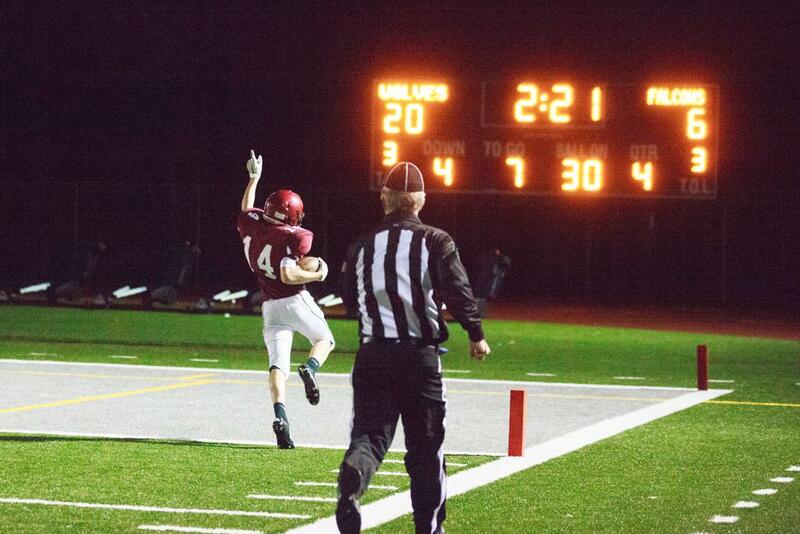 Sutter returned the Woodinville punt to the Falcons’ 28 yard line. Two straight runs by Sutter had Eastlake on the doorstep of another touchdown but a fumble gave the ball right back to Woodinville. The Falcon offense took the field with the ball five yards from its own end zone. After two ineffective plays the Woodinville QB stared down his intended receiver allowing Rud to make a leaping interception that he took right into the Woodinville end zone for a touchdown. Thornton nailed the PAT giving Eastlake a more comfortable 20-6 lead. Woodinville’s next possession started at its own 35 yard line and ended quickly, with defensive lineman Kyle Baisler sacking the Falcon QB on 4th down. 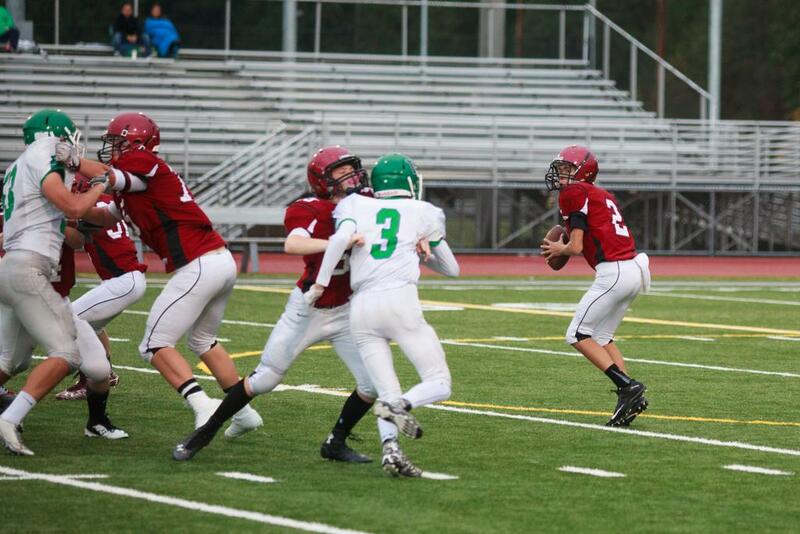 The Wolves’ offense took over at the Woodinville 34 and ran three plays before Monteiro hit Broc Stauffer on a vertical route for a touchdown. After another Thornton PAT, the score was 27-6 in favor of Eastlake. Woodinville wouldn’t give up and managed its own long touchdown pass on 4th down, despite the game being out of reach. The final horn sounded with Eastlake in the Victory Formation.